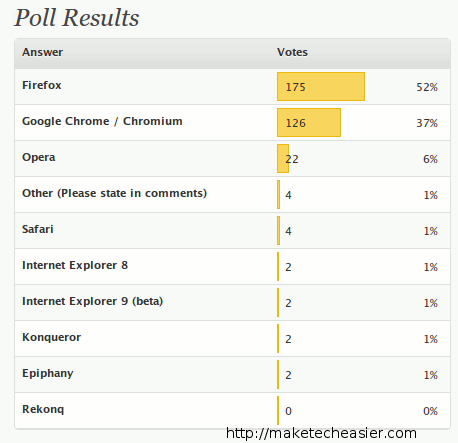 The poll last week was “What is your favorite browser?” and the results were out. More than half of you (52%) loved Firefox while Google Chrome came in second at 37%. Opera is third with 6% of the vote while Safari, Internet Explorer, Konqueror and Epiphany received 1% of the votes respectively. A total of 339 votes were casted. The question for this week’s poll is: How Many Social Networks Are You Actively Involved? By “social networks”, it can refer to Facebook, Twitter, LInkedIn, FriendFeed, Orkut etc. By “actively involved”, it means you login (and use) the social network at least once per day. Sorry, but what happend to “0”, zero, nada none? It was there, but Polldaddy deleted it (I guess it thought was blank entry) and I didn’t notice it. I have re-added it.